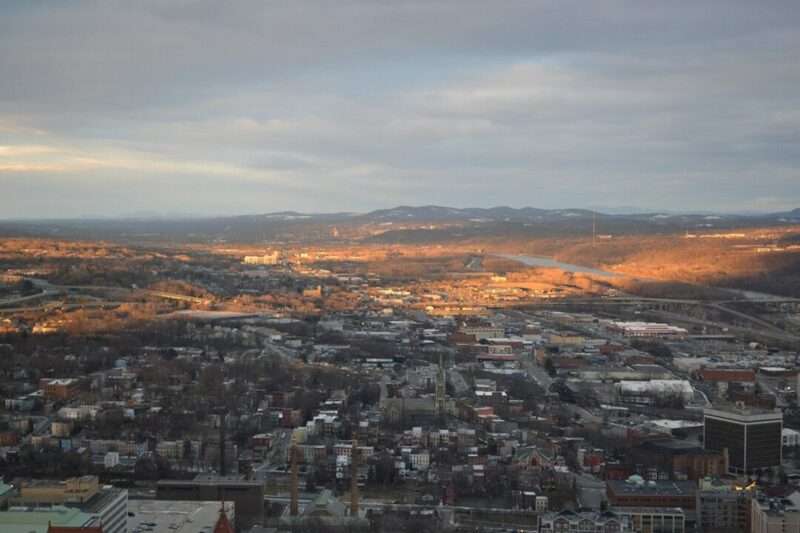 On Saturday afternoon, conservationists from across the Capital Region met at the Corning Tower in downtown Albany to celebrate 25 years of land conservation with the Mohawk Hudson Land Conservancy (MHLC). The sold-out crowd filled the observation deck, enjoying drinks and a light buffet as a cloudy sky opened and rays of light from the setting sun spread across the breathtaking landscape below. Stewart Dutfield, Rail Trail Ambassador Coordinator for the Albany County Helderberg Hudson Rail Trail, was honored for his work organizing over 50 of these volunteers to monitor the Rail Trail and provide weekly reports on Rail Trail conditions and issues. Mr. Dutfield was presented with the inaugural Dan Driscoll Leadership Award, named in memory of Dan Driscoll, founding member, past board chair, and dedicated volunteer. Matthew Bender was recognized as MHLC’s 25th Anniversary Honoree. Honored for his significant contribution to the Conservancy as a devoted supporter and passionate advocate for land conservation in the Capital Region, Mr. Bender spoke of his history of working with MHLC since the organization’s founding in 1992. “Matt Bender’s dedication and generosity exemplify the strong spirit of conservation among our supporters. We are thrilled to honor Matt and his years of generous support, which have helped MHLC become an active and crucial force in regional land preservation,” said King. The evening was the first of dozens of celebratory, conservation-focused events open to the public and hosted by MHLC in 2017. On Feb. 18 , MHLC will feature its first outdoor event of the year with a day of fat biking on the trails of its Keleher Preserve in Voorheesville, with food and beverages provided by Bountiful Bread of Stuyvesant Plaza. As the weather begins to warm in April, MHLC will partner with Ondatra Adventures to host a Hiking and Backpacking Tips and Tricks Workshop. In the summer and fall, the public is invited to a series of programs including birding hikes, new preserve openings, family wilderness craft programs, a Hike-a- Thon in July, and a special gala affair at Thacher Park’s new visitor center in September. More information on all events can be found at www.mohawkhudson.org. After 25 years, the Mohawk Hudson Land Conservancy continues to expand and connect the network of preserved lands across Albany, Montgomery, and Schenectady Counties. The growing community of conservationists and supporters who make this preservation work possible are a group of people dedicated to protecting the scenic, recreational, and environmental value of the Capital Region landscape. In celebration of its silver anniversary, MHLC invites friends both old and new to join in a year of conservation, recreation, and connection. The Mohawk Hudson Land Conservancy (MHLC) is a nonprofit conservation organization working to preserve the natural, scenic, agricultural and cultural landscapes of the Mohawk and Hudson River valleys. Since its founding in 1992, the Conservancy has protected more than 5,000 acres of land in Albany, Montgomery, and Schenectady Counties, including over 2,000 acres open to the public for hiking, cross- country skiing, and other educational and recreational opportunities. MHLC also manages more than four miles of the Albany County Helderberg Hudson Rail Trail through an agreement with Albany County.